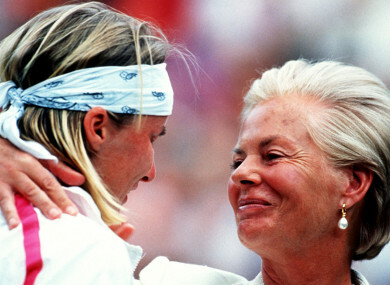 After sharing an emotional moment on Centre Court in 1993, the Duchess of Kent has paid tribute to Jana Novotna, who died on Sunday. BRITAINS DUCHESS OF Kent has expressed her sadness at the death of 1998 Wimbledon champion Jana Novotna. A statement from the WTA on Monday confirmed Novotna had passed away from cancer on Sunday, the 49-year-old having been surrounded by her family. During her illustrious career Novotna claimed 100 WTA titles, including her sole singles grand slam crown at SW19. Her triumph in 1998 came five years after a heart-breaking defeat on Centre Court against Steffi Graf, the German rallying to win in three sets despite being 4-1 behind. At the presentation ceremony Novotna was in tears when accepting her runners-up trophy from the Duchess of Kent – who was a shoulder for the Czech to cry on. It is an iconic Wimbledon image that made Novotna’s win later in the decade even more special, and that moment left a lasting memory with the Duchess. “Jana Novotna was a brave, courageous sweet lady with a wonderful sense of humour,” she said in quotes released on The Royal Family Twitter account. “I am saddened to by the news of her death and all my feelings are with her family. Email “Wimbledon will not be the same without her – Duchess pays tribute to Novotna”. Feedback on “Wimbledon will not be the same without her – Duchess pays tribute to Novotna”.